Council workers hoping to spruce up their street for a competition in St. Petersburg went a little too far and got themselves disqualified when they taped branches to bare trees, it's reported. The "Cosy Garden 2017" competition in Russia's northern city aims to praise neighbourhoods that make an effort to beautify themselves, but local people on Tkachey Street were unimpressed when they saw gardeners had taped green branches to wilting trees - especially when they weren't even from the same type of tree, Life website reported. Volunteers for the pro-government All-Russia People's Front movement, who were checking entrants for the competition, confirmed this. "Visitors to the garden say there used to be beautiful rowan trees here, but lack of proper care meant they died. 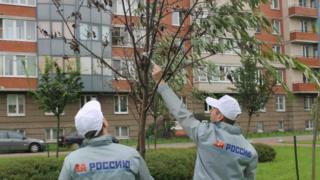 But then two days ago the dried-out rowan trees 'turned into' weeping willows," volunteer Dmitry Gruzdev told Life. The city fathers were more sympathetic. St Petersburg Council said it understood why, after a severe winter, the park keepers "wanted to try to save the rowans and not uproot them while a chance still remained". But, after sending inspectors to examine the site, it concluded that "gilding the lily" was not acceptable within the terms of the competition, and disqualified Tkachey Street. "Cosy Garden aims not to reward participants with money but to win them the recognition of professionals in their field, as well as that of the local people," the council said by way of explanation on its website. But it did hold out hope for the future: "The spring of 2018 will tell whether the real work of trying to revive the rowan trees this summer has borne fruit - as long as the 'redecoration' didn't do any harm." Social media comment has been less generous. "It's a madhouse," wrote one reader on the Life story, while others suggested the council workers should "get their wages by fax" and any "bonuses should come in photocopied banknotes!"